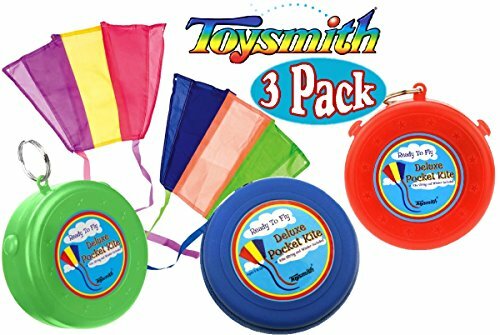 Gift Set Bundle Includes 3 Different Toysmith Ready to Fly Deluxe Pocket Kites (Red, Blue & Green)! Store the rip-stop nylon kite inside its hard plastic 3.25 inch case. Kites unfold to 18 x 12 inches, with two 29 inch tails. Includes kite string and winder. Perfect for travel, party favors, giveaways, schools, organizations, stocking stuffers, special needs, therapy, stress relief & so much more! Perfect for ages 5 and up. Gift Set Bundle Includes 3 Different Toysmith Ready to Fly Deluxe Pocket Kites (Red, Blue & Green)! Store the rip-stop nylon kite inside its hard plastic 3.25 inch case. Kites unfold to 18 x 12 inches, with two 29 inch tails. Includes kite string and winder. Perfect for travel, party favors, giveaways, schools, organizations, stocking stuffers, special needs, therapy, stress relief & so much more! If you have any questions about this product by Toysmith, contact us by completing and submitting the form below. If you are looking for a specif part number, please include it with your message.